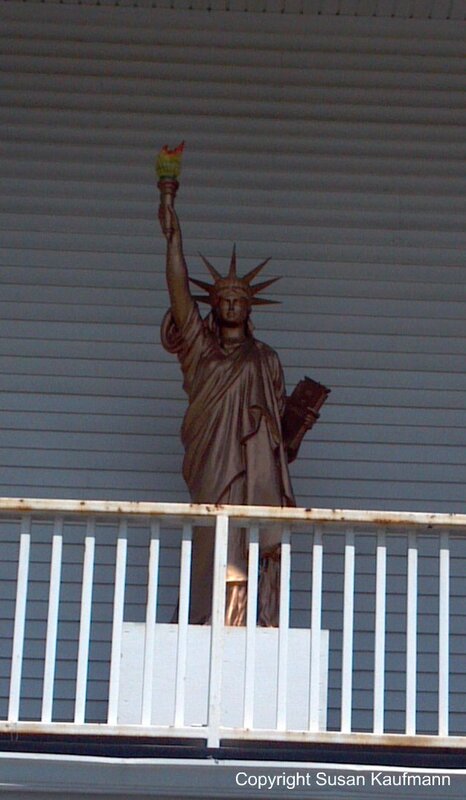 Longtime readers may recall our surprising discovery of the Statue of Liberty on the balcony of the Butler Police station. To sum up, this eight foot-high replica - which looks pretty accurate at a distance - stands proudly in a prominent part of town, with no apparent connection to the community besides a general air of patriotism. A street in town is named for the statue's sculptor, Frederic Bartholdi, whom we later discovered was a friend of Richard Butler, the community's namesake whose rubber factory was once the largest employer in town. However, there's no prominent signage to describe the link to curious passers-by. A bit more digging led us to discover that Mr. Butler had his own connection to Liberty Enlightening the World, as the statue is more officially known. The rubber magnate was the Lee Iacocca of his time, playing a major role in raising funds for the construction of the Statue's pedestal. As secretary of the American Committee for the Statue of Liberty, he donated the services of his rubber factory to ship miniature Statues to contributors. In recognition of his service, the French government named him a Chevalier of the Legion of Honor. That solved one mystery, but we were still left to wonder about the origin of the police station Liberty. We figured she probably wasn't actually manufactured in Butler, since the statuettes the rubber company shipped were made by the Newton Bottle Stopper Company of New York. Still, she looks too accurate to have been crafted by a well-meaning fan. It took us a while, but we got the answer during a visit to the Butler Museum during Morris County's recent Pathways to History weekend. 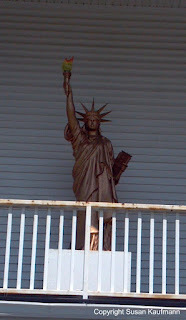 According to the Butler Historical Society folks, their Liberty was one of several that were used as decoration on Liberty Island for the Statue's rededication celebration in 1986. How it got from the celebration to Butler is another question for another day; our friends at the Historical Society invited us to come back to review their substantial collection of Statue-related documents, ephemera and artifacts. We kind of like this mystery and where it's taken us. Sometimes uncovering the story in pieces is even more fun than getting to the bottom of it in one swipe.